First, Gaudreault and Marion open a can of worms. Ten cans, in fact. They identify concepts and principles that led to the formation of cinema as a culmination, extension and initiation of various “cultural series” from its several beginnings, through its repeated “deaths” and “rebirths.” Then they attempt to put the troublesome and highly problematic worms back into the cans. Along the way they engage such difficult issues of history, theory and philosophy as whether cinema has an essential nature—an anima—and whether film presentations are recordings, archives or performances that transcend their photochemical or digital traces. 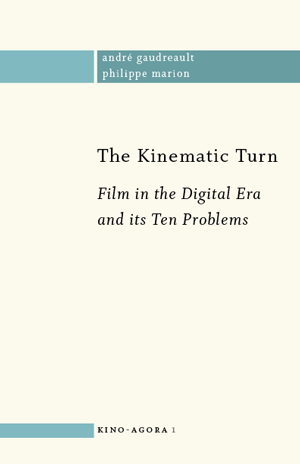 In its deceptively few but idea-packed pages, The Kinematic Turn provides a concise handbook that will provoke students, teachers, film specialists and anyone else who thinks deeply about contemporary media cultures. They will become informed, intrigued, swayed, outraged and fully absorbed in these arguments. The crises that cinema has undergone in its genealogy demonstrate the implicit hybridisation shaping any medium’s identity. A medium’s seemingly singular identity is never more than an evolving federation of media from a range of cultural series that have historically crystallised and been vouchsafed in a relatively consensual manner by an institution. Seen in this light, we might almost say that media are always hypermedia that are unaware of the fact. To carry out the dynamic genealogy we are outlining here, it is particularly important to undertake an applied mirror image study: if we wish to understand the evolution of cinema’s identity we must first attempt to understand the hybridisation phenomena at work at both ends. The first end was the turn of the twentieth century, that intermedial mash-up, that veritable broth of media culture around the birth of kinematography, to which corresponds, at the other end, today’s intermedial mash-up of what we call the kinematic in the polyphony of contemporary hypermedia. October 2012, 51 pp., 5.5” x 8.5”. Paperback, ISBN 978-0-9811914-3-0, $5 + $8 in stores. Electronic version, ISBN 978-0-9811914-3-0, $4. André Gaudreault is a professor in the Département d’histoire de l’art et d’études cinématographiques at the Université de Montréal, where he is director of GRAFICS (Groupe de recherche sur l’avènement et la formation des institutions cinématographique et scénique). His books include studies of narratology in film ( From Plato to Lumière: Narration and Monstration in Literature and Cinema , 2009) and film history ( American Cinema, 1890-1909 , ed., 2009; Film and Attraction: From Kinematography to Cinema , 2011; The Blackwell Companion to Early Cinema , co-ed., 2012). He is also the director of the bilingual scholarly journal Cinémas . Philippe Marion is a professor in the École de communication of the Université de Louvain and in the Facultés universitaires in Namur and Mons, Belgium. Co-founder of the Observatoire du récit médiatique (ORM) and director of the research group Analyse des médias, he specialises in comparative narratology, media narratology and visual culture. He is the author of several books, including Traces en cases, essai sur la bande dessinée et son lecteur (1993); L’année des médias (1998); and Schuiten, filiation (2009). A pianist and composer, he has participated in numerous film festivals (including the project Crazy Cinematographe ) as an accompanist to silent film.